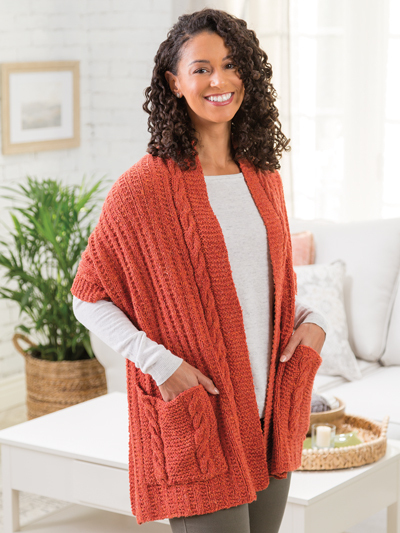 Enjoy a cozy wrap to keep you warm while you’re curled up with a good book! Just download to your computer, no shipping! Formats available: PDF What's this? These reader’s wraps are perfect for snuggling in front of the fire with your favorite novel and a cup of hot cocoa. 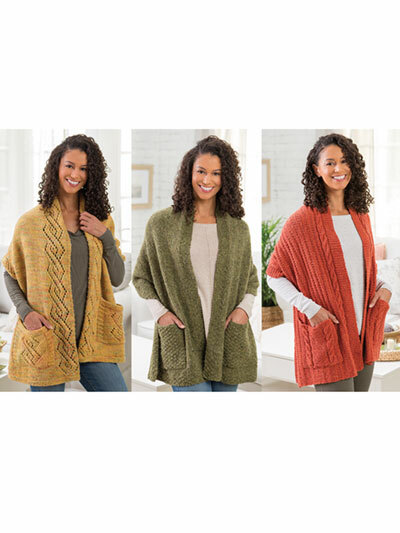 Knit up a delicate, lacy wrap or a little heavier one with worsted-weight yarn to give to a friend or keep from yourself. Designs by Lisa Knits. Cabled & Lace Wrap: Knit with 1,000 yds of Aran-weight yarn at a gauge of 16 sts per 4" using U.S. size 9/5.5mm needles. Approximate finished measurement: 20"W x 60"L. Skill Level: Intermediate. Original Wrap: Knit with 900 yds of worsted-weight yarn at a gauge of 16 sts per 4" using U.S. size 9/5.5mm needles. Finished size: 20"W x 60"L. Skill Level: Beginner to Easy. I am nearly finished with the lace version of this pattern. The garter stitch border at the start is too narrow and the shawl is curling. I would have been happier if there were more rows at the beginning and end, or perhaps seed stitch or another edging. The lace pattern is lovely. I love these wraps. They are very easy. I started one for myself and when my mother saw it she just fell in love with it! So, she will get the first one. I already bought the yarn for the next one! I made this for my sister for her birthday and it turned out great! It is my 3rd project (I started knitting in March) and it was easy and turned out wonderful. I'm going to make another one for myself. I just finished this wrap for my sister. It's been sent off to her and I can't wait to hear her reaction. I loved it and am about to start one for myself. Definitely a pattern that I will use over and over again. I love the readers wrap! A great gift for a friend. I knitted one for myself, my sister walked out the door with it! I knitted another, my daughter walked out with it, I am almost finished and my mother is staying until I finish one for her! Will I get one for myself? I hope so!